In this episode, we discuss the new Flex Frame native advertising unit introduced by The New York Times — and what it can teach marketers about user experience. 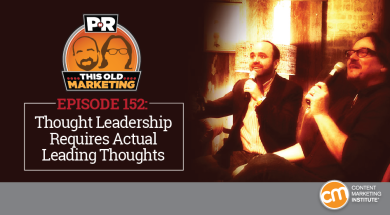 We also dissect the art of thought leadership, which requires both thought and leadership, and grill McDonald’s for its YouTube channel fail. Rants and raves include a video on why businesses may be walking away from the Twitter negotiation table, and the launch of Facebook’s new Marketplace; then we wrap up with an example of the week from Pressed Juicery. The New York Times to replace banner ads with a new proprietary format (07:40): Responding to the trend of platforms like Facebook and Google developing their own signature ad units, the Times is rolling out its own cross-device ad format, called Flex Frame. According to the The Wall Street Journal, the move is meant to modernize the Times’ display ad business, while improving the experience for both readers and marketers. Robert offers his thoughts on how the new format seems ripe for high-quality content, while I discuss my reservations that this business model will be effective over the long term — particularly if and when the popularity and profitability of native advertising starts to decline. How Does Native Advertising Fit in a Content Marketing Strategy? New rules of thought leadership in the content age (19:37): Exploring the role of thought leadership in today’s marketing mix, a new Economist Group report suggests that the technique offers big rewards for those who get it right — though it faces several key challenges, including the need to focus on evidence-based content and continually push the envelope in terms of presentation, targeting, and distribution. Not only was Robert really impressed with the presentation and user experience of the study’s microsite, I feel the piece emphasizes just how critical it is for marketers to take a definitive stance in their thought leadership content, and back up their assertions with data. What McDonald’s has learned from its failed YouTube channel (32:55): In an interview for news site The Drum, Ben Fox, McDonald’s head of media and customer engagement, opens up about why the company shut down its youth-focused YouTube channel; how challenging, yet essential it is to create content with a purpose; and how the brand plans to continue playing in the content space. Among the many questions this program raises in our minds, Robert wonders why McDonald’s allowed the format, rather than the story, to drive the idea, while I’m at a loss to understand what the purpose and ultimate goal might have been in the first place. 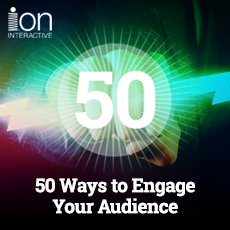 ion interactive: 50 Ways to Engage Your Audience — Interactive Lookbook: Want a fun way to get 50 ideas for improving content engagement? That’s what this interactive lookbook is all about. Each capability is illustrated as an example of itself. Have fun. Get ideas. Get results. Get the Lookbook. Robert’s “commentary” No. 1: It seems Google, Salesforce, and other potential suitors may have lost interest in purchasing Twitter, sending the social network’s stock into a shame spiral. Despite reports that a potential deal is dead, this video from The Wall Street Journal points out that this is common behavior for companies that may be looking to drive down the share price before making an offer. In my mind, Google is still the leading contender for a Twitter acquisition, and would potentially be making a big mistake by walking away from the negotiating table at this stage. Robert’s “commentary” No. 2: Another story blowing up on Robert’s social feed this week was the NFL announcing that it notified all 32 teams that they are prohibited from posting gifs and video on social media during games. Robert (somewhat surprisingly) agrees with the new rule, as he believes it helps the NFL brand maintain the value and integrity of its actual broadcasts. 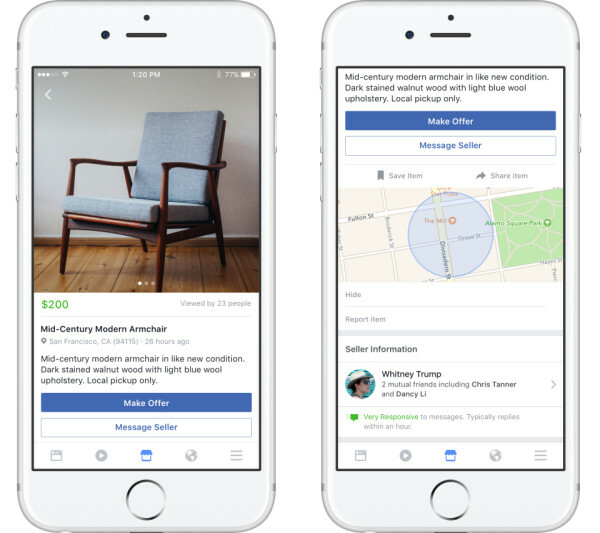 Joe’s rave: Jeremiah Owyang’s latest Web Strategist blog post discusses Facebook’s launch of its Marketplace, a new feature that enables users to buy and sell used goods using Facebook connections. While this initiative may still have some work to do before it can truly take root, I’m encouraged to see Facebook starting to diversify its revenue streams and reduce its reliance on advertising revenue for monetization. I also propose a potential partnership that might be a great marketing match for this Marketplace. Robert recently came across a wonderful story on Growth Everywhere about Pressed Juicery — a fresh juice business local to California. CEO and co-founder Hayden Slater was a self-proclaimed fast-food junkie who lost 60 pounds after introducing juicing into his daily diet. Later, he decided to take his passion for the health benefits of juice and pour it into a business that followed this new-found approach to healthier living. For the first three years, the company’s main marketing platform was a media property called The Chalkboard — a lifestyle-focused digital magazine that shared expert insights, healthy recipes, nutrition, beauty, and wellness tips, and plenty of inspiration for toxin-free living. With a content mission of serving as a modern guide to living well, The Chalkboard helped Pressed Juicery create 1.3 billion media impressions — and did so at a cost of less than $20K. Today the company has over 600 employees at 40 store locations, and has diversified its use of Chalkboard content to feed a growing portfolio of social media channels. Not only does Pressed Juicery’s experience make for a wonderful story of (wheat?) grass-root success, it’s also a shining example of how companies can build an online audience, then use it to drive actual foot traffic to its physical stores.